The basics of an eclipse, that most anyone can tell you, are that one object in space casts a shadow on another. The two flavors that we appreciate here on Earth are solar eclipses and lunar eclipses. 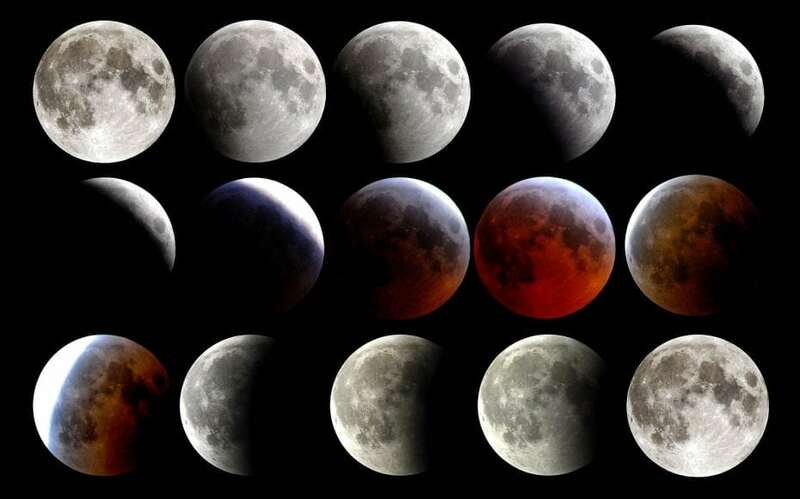 A lunar eclipse is when the shadow of the earth covers the face of the moon; and a solar eclipse is the exact opposite, when the shadow of the moon covers a portion of the earth. Due to the relative size of the earth compared to the moon, a lunar eclipse covers the entire moon and a solar eclipse only casts a shadow on a small area of Earth. But that definition that doesn’t tell you when or where an eclipse will happen, or why those are not easily predictable. As eclipses often attract crowds to view them, this is a good time to show off your science skills and convince everyone around that you are a genius. Here are all the terms and jargon you need in order to look like you know what is happening. The lunar orbit around Earth is not perfectly circular but instead traces an ellipse. The distance between the earth and the moon changes by about 31,000 miles due to the moon’s elliptical orbit. The two extremes of this orbit are called the perigee (when the moon is closest to Earth) and apogee (when it is furthest away). This distance change corresponds to an apparent size change of about 14% if you were to look at the moon when it is closest and furthest away. You may have heard of supermoons and king tides; these correspond to perigee since the moon looks largest and has the greatest impact on tides at this time. The moon makes a complete revolution around the earth, measured against distant stars, once every 27.32 days. This time period is called a sidereal month; pay attention to the names because this will get complicated quickly. An ellipse has two apses which are the two points furthest apart; think of these as the top and bottom of an egg. The whole ellipse that the moon travels along also rotates around the earth, although very slowly (it takes about 8.85 years to make a complete revolution). The time it takes for the moon to travel from one apsis on its ellipse to the same apsis (the time between perigees) is called an anomalistic month. Since this ellipse is slowly rotating, the apsis moves a little further away from the moon during a month; this makes an anomalistic month last 27.55 days. These two months are not to be confused with the time between full moons, called a synodic month, which is somewhere between 29 and 30 days depending on the time of year. Since the timing of a full moon depends on the angle between the sun and Earth, this takes longer than a sidereal month due to the distance Earth has traveled in that time. If the moon revolved on the same plane as the Earth revolves around the sun, then we would have two eclipses every synodic month: one lunar and one solar. However, the moon’s plane of orbit is tilted by a little over 5 degrees from Earth’s. This tilt is enough for the shadows of both bodies to avoid each other most of the time. The flat surface on which the earth revolves around the sun is known as the ecliptic plane. Viewed from Earth, the sun is located directly along the ecliptic plane; by no coincidence, eclipses can only occur when the moon is passing through this plane. 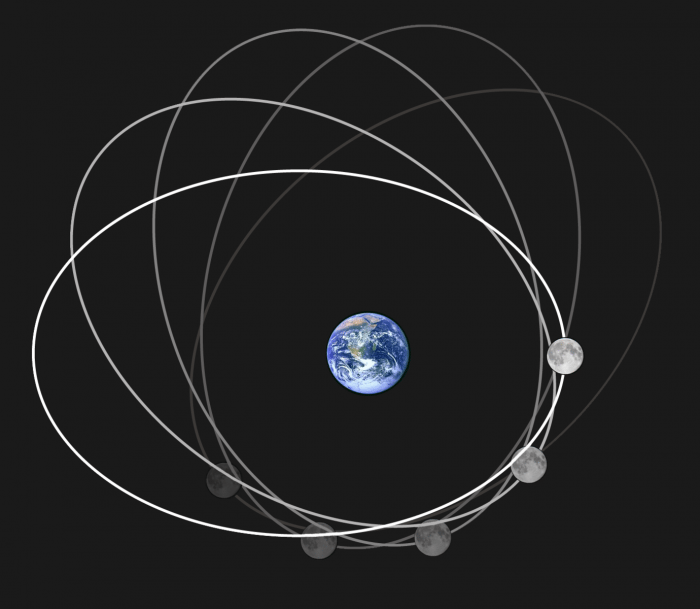 To complicate things even further, the plane of the moon’s orbit gradually rotates around Earth as well. This rotation alters the time that it takes for the moon to cross through the ecliptic plane; the time it takes the moon to pass through the ecliptic plane twice (to complete a full loop downward and upward) is called a draconic month and lasts 27.21 days. The timing, location, duration, and totality of a solar eclipse is anything but random, hence why scientists can predict them exactly. However, the calculations to determine these details are more complicated than the Newtonian physics most of us learned in high school. An eclipse occurs whenever the moon is along the ecliptic plane and it passes through the line drawn between the center of the earth and center of the sun. The moon is in line with the earth and the sun only during a full moon and a new moon. A lunar eclipse can only occur during a full moon, as this is when the earth is between the sun and the moon. Similarly, a solar eclipse can only occur during a new moon, when the moon is between the sun and Earth. For either of these events to occur, the timing of the draconic and synodic months must synchronize. The main terms you need to know for a total solar eclipse are umbra, penumbra, and path of totality. As demonstrated in the diagram, the penumbra is the entire area under some shade due to the eclipse. 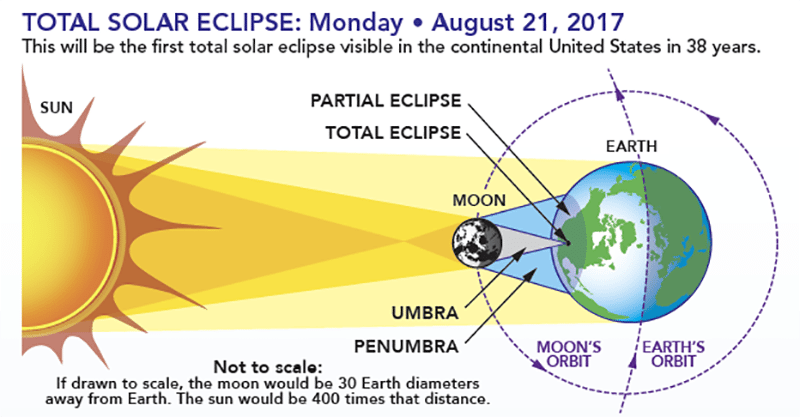 If you are viewing the eclipse from a location in the penumbra, you will view a partial solar eclipse where a portion of the sun’s light is blocked. The umbra is the region of total shadow where the sun’s light is completely blocked. If you are lucky enough to be viewing from a location in the umbra, you will see a total solar eclipse where the sky will appear almost as dark as night. The total solar eclipse is only visible from a small region at any given time. This small region of shadow will trace across the surface of the earth in what is called the path of totality, simply all places that can view the total solar eclipse. Any shadow has an umbra and penumbra. Typically on Earth, the light source is very small compared to the object casting a shadow; this makes the umbra appear larger behind the object. This is why you can make large shadow puppets on the wall using the light from a light bulb; since your hands are larger than the bulb’s filament, the umbra of your hand on the wall is larger than your hand. The sun, however, is much larger than the earth or the moon, which causes the umbra of both to shrink as distance increases. If you imagine every atom in the sun casting light in all directions around itself, the light waves that reach Earth or the moon are not all perfectly parallel. In the diagram, the light from an atom in the center of the sun will follow a straight line drawn through the center of the earth and moon. The light radiated by an atom at the top of the sun, however, will reach the top of the moon at a slight downward angle and will continue past the moon at the same angle until it reaches Earth. The same is true for a light wave originating from the bottom of the sun, except it will be angled upward. Where these two light waves meet is where the moon’s umbra ends and the last location to view a total solar eclipse. We already covered the fact that the moon has an elliptical orbit; similarly, Earth’s orbit around the sun is also elliptical although it is very close to a true circle. Due to Earth’ orbit, the relative size of the sun also changes from the perspective of an observer on Earth. If you have made it this far, you are now asking yourself: if the moon changes in size by 14%, how much does the sun change in size?!? The answer is by about 3% between January, when it is largest, and July when it is smallest. Three percent in appearance corresponds to an actual distance change of about 3.1 million miles between the earth and sun. In case you are curious, these events are named the perihelion, which occurs around January 3rd, and the aphelion, which occurs around July 4th; the exact time of each varies from year to year. A three percent change in the size of the sun is pretty small; no one is going to step outside and notice this difference. This three percent, when combined with the moon’s 14%, does, however, have a significant effect on the duration of solar eclipses as well as the size of the path of totality. There are two types of solar eclipses: total and annular. The distance from the moon to the earth happens to be at exactly the right length so that sometimes the umbra reaches the earth’s surface (total eclipse) and sometimes it does not (annular eclipse). There is even such a thing as a hybrid solar eclipse, where some places on Earth view a total eclipse and some can only view an annular during the same eclipse. 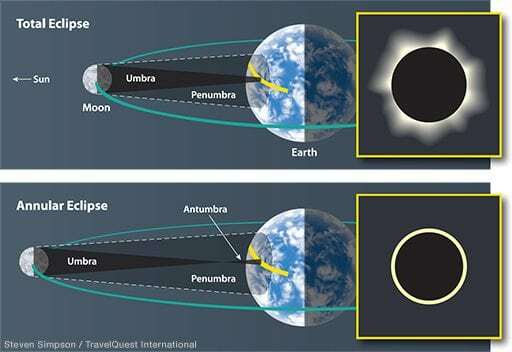 An annular eclipse comes along with an extra term called the antumbra, which is the area behind the umbra where the two sides of the penumbra cross. Using some averaged values, we can calculate the approximate length of the moon’s shadow; scientists use an exact measure of this length to determine when a solar eclipse will be total or annular. The distance from the center of the earth to the center of the moon varies from about 221,500 mi. at perigee to about 252,700 mi. at apogee. Compare that to the distance between Earth and the sun, which oscillates between approx. 91.4 million mi. and approx. 94.5 million mi. These mean that the possible distance between the sun and the moon (D in the diagram) can vary between about 90.75 million mi. and 94.28 million mi. when the moon is in the correct position to cause a solar eclipse. Using the average solar radius of 432,288 mi. and average lunar radius of 1079.5 mi., we can calculate the length of the moon’s umbra (d) according to the equation sin(θ) = (R – r)/D from the diagram below. The two values of D give us a θ that varies between about 26 and 27.5 degrees, which causes the d in the diagram to vary from about 228,000 mi. to about 236,000 mi. This d is the distance from the center of the moon to the end of its umbra; if we want to witness a total solar eclipse, we want the distance from the center of the moon to the surface of the earth to be less than d. Using Earth’s average radius of 3959 miles, the distance from the center of the moon to Earth’s surface varies between about 217,500 miles and about 248,700 miles. Looking at these numbers, it is clear that a total solar eclipse is not visible when the moon is at a point in its orbit close to apogee. Given all of the simplifications we used for this calculation, you can also see why it is so difficult to calculate the exact location, time, and size of the path of totality. The timing of both solar and lunar eclipses are linked together by the relative positions of the sun, moon, and Earth. The relative positions of all three bodies almost reset at a period of approximately 6585.3 days (18 years, 11 days, and 8 hours). This time period is called a Saros cycle and was first discovered by the Chaldeans (in the modern day Middle East) several hundred years before Christ. This period of 6585.3 days is derived from 3 of the lunar months discussed earlier (synodic, anomalistic, and draconic). You can think of the Saros cycle as the least common multiple (that thing your 5th-grade teacher told you that you would need one day) among these 3 months. One Saros cycle is incredibly close to synchronizing 223 synodic months, 239 anomalistic months, and 242 draconic months. There are other contributing factors that do not make it easy for us on Earth to give a simple explanation of when the next eclipse will occur. Although the earth and moon follow predefined orbits, these orbits are not perfectly flat along the orbital plane. There are minute fluctuations in the height of orbit of both bodies; obviously, these changes influence eclipses. Also, the velocities of the earth and moon change as the orbit; there are regular speed changes due to the elliptical orbits as well as small deviations that need to be taken into account. The moral of the story is to trust the scientists to predict eclipses, as they have the high power measurement equipment and computers to calculate these events exactly. The Saros cycle does not mean that the same solar eclipse occurs at the same place on Earth every 6585 days, but instead that the geometric alignment of the three bodies will be very similar every cycle. For one, the Saros cycle is not equal to a whole number of days; it has those extra 8 hours added on the end. So after every cycle, the location on Earth that can view a solar eclipse will move to the west by about 120 degrees longitude (8 hours = 8/24 = 1/3 of Earth’s revolution = 120°/360°). That means that after 3 Saros cycles (54 years and 34 days) everything will sync up right? Again, it is not that simple; trust the scientists. The Saros cycle is incredibly close to synchronizing the 3 lunar cycles we discussed, but they do not quite align. Although solar eclipses are more complicated, lunar eclipses do repeat themselves almost exactly along the Saros cycle; this is because the size of Earth’s umbra is relatively large compared to the moon, so the shadow does not need to be perfectly aligned to cause an eclipse. All of the basics we have covered so far have assumed that the earth, moon, and sun are perfectly smooth spheres; this is not true. Scientists are continuously improving eclipse predictions by incorporating all the details of these celestial bodies. 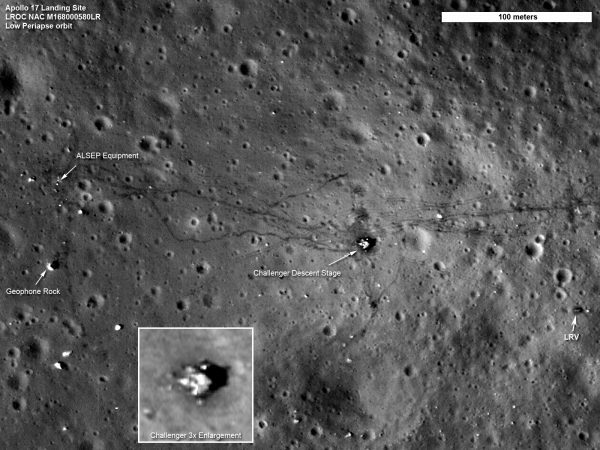 The Lunar Reconnaissance Orbiter is a relatively new NASA mission whose goal to gain more information about our moon. It is a small satellite launched in 2009 that orbits the moon around the poles with a variety of sensors continuously measuring the surface. The data from this satellite has significantly improved the accuracy of eclipse predictions. Since the surface of the moon is covered with impact craters and other geologic features, the profile of the surface at any given point makes a difference in the shape and size of the umbra, just like your shadow puppets. Scientists have been able to use this more detailed information, as well as the height of any geographic features on Earth, to give an exact shape to the area of totality at any given time. Taking a close look at eclipse predictions, you will see that the shape of the shadow on the surface of the earth is not a circle but looks more like an oval with flat sides. Eclipses have been well documented in all advanced civilizations for thousands of years. Since they have remained popular topics of conversation up to today, you can think of these natural phenomena as some of the earliest pop culture events. The Mayans (among other cultures) are famous for their astronomical expertise, and anthropologists who interpreted the Mayan codices have shown they predicted some eclipses up to modern day within an error of +/- 1 day. This is amazingly accurate given the tools they had at hand. One factor to take into account when looking at ancient records is that the earth does not rotate at the same rate all of the time. Since almost everyone in history has used a day as a basis to measure time, this variation is called the earth’s clock error. The name comes from the assumption that the length of a day is used to measure time (like a clock), any change in the rate of rotation will change the length of a day and cause an error in time measurement. This long term change is caused by factors such as solar and lunar tides as well as shifting of mass on Earth due to glacial melting and land mass movement. The cumulative effect of this change has shifted the true time of midnight by up to 7 hours over the past 3000 years. This slow change is not enough to noticeably affect the measurement of time until the next eclipse, but does play a role when reading eclipse records from ancient civilizations. That is the short and sweet science behind eclipses. 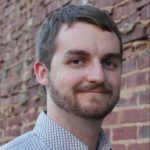 If you would like to dive deeper into the physics of an eclipse, feel free to check out the links below. In order to safely view a solar eclipse, you need a filter that blocks a vast majority of solar radiation (NOT just sunglasses). Luckily simple glasses with solar filters are available online for low cost, and are advertised online before most eclipses. The only time it is safe to look directly at the sun with no filter is during totality. If the sun is completely blocked, feel free to stare directly at it; but be careful, totality will only last a few minutes. If you are in the path of totality, the partial eclipse will last much longer; remember to take advantage of this time to brag to everyone that you can explain why this rare event happens.